. We know our agency partners juggle a lot at once, between the RFPs and last-minute campaign launches, traffic reports and research studies -- and we’ve been on the lookout for ways that Google+ can make your day a little easier. Host focus groups -- Get immediate feedback and insights from consumers via a Hangout. Have a face-to-face conversation online, as if you were in the same room. See how your work gets shared -- See the earned media effects of a campaign by entering a URL or YouTube video into Ripples, which show how posts are shared and reshared on Google+. Review portfolios -- Can’t visit every job fair? Host a Hangout to give live feedback on advertising and marketing students’ work. Announce ahead of time on your Page. Meet with clients -- Connect with your clients on a Hangout to review new initiatives, get feedback on creative or even hold a planning meeting. Utilize Screenshare or Google Docs to jointly view proposals. Manage projects -- Trying to keep everyone informed on your most recent project? Keep the team in the loop by creating a Circle just for everyone involved. Communicate with clients -- Organize your contacts by client or even industry in Circles so you can share insights with the most relevant audience. Lead the way -- Host a Hangout On Air featuring influencers in your agency to shine a spotlight on research, share case studies or provide insights on trends. Show and tell -- Have a piece of stellar creative you’ve completed or a great insight you just discovered? Share it on your Page and start a discussion with others who might learn from your experience. Be seen on search -- Give your stamp of approval to articles, videos and research that you would recommend with the +1 button. Your friends will see your recommendations when they search. Want more? Download the full booklet and share it with your coworkers -- or even hang it at your desk! And if you have your own tips and tricks for using Google+ as an agency, share them today over at Creative Sandbox with hashtag #g+toptips. Throughout the summer, we’ve been sharing 10 simple tips for utilizing Google+ over at Creative Sandbox. We know our agency partners juggle a lot at once, between the RFPs and last-minute campaign launches, traffic reports and research studies -- and we’ve been on the lookout for ways that Google+ can make your day a little easier. for a webinar about our recently released research, "The New Multi-screen World: Understanding Cross-Platform Consumer Behavior." The webinar will share our research findings on how the growth of device ownership has changed the way that people consume media. We will also discuss specific strategies that businesses and advertisers can employ to take advantage of these multi-screen behaviors and more effectively connect with their target audience. 90% of media consumption today is screen based, and the growing number of digital devices is rapidly changing the way people search, shop, and connect with people or businesses. To make the most of all of their devices consumers have developed common patterns of multi-screen behavior, and this multi-screening has quickly become the norm. In order to gain a deeper understanding of this changing consumer media behavior, we conducted some new research. Join Google on Thursday, August 30th (10am PT/1pm ET) for a webinar about our recently released research, "The New Multi-screen World: Understanding Cross-Platform Consumer Behavior." and updated articles in the Help Center, or view our recorded webinar here. As a search marketer, you know that bid optimization is one of the critical aspects of managing search at scale, providing sophisticated technology to meet your unique business goals. 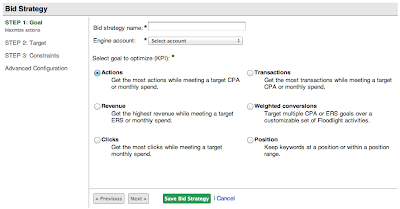 Over the past 18 months, the DoubleClick Search team has been focused on enhancing our automated bidding tools -- understanding that this is the engine that drives campaign performance. 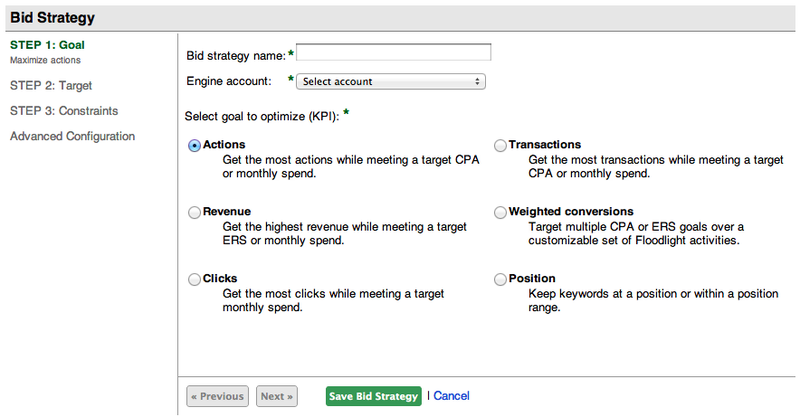 We've rebuilt our bid optimization platform from the ground up -- no single line of code is the same! -- and our users are already seeing some impressive results: 88% have experienced significant improvements in campaign performance, with 50% doubling their conversions at half the CPA (1). If you'd like to get started exploring the Performance Bidding Suite, you can check out the latest release notes and updated articles in the Help Center, or view our recorded webinar here. There's no question that technology has fundamentally transformed the business of advertising. We think the really exciting changes come when we are able to re-imagine not just the ads themselves, but the whole process of conceiving and developing them. The "Mad Men" of the future will not only be fluent in technology, but also in the evolving, highly adaptable, "launch and iterate" style that has become the signature of Silicon Valley. Developed in close partnership with ad industry executives, Agile Creativity is a playbook that agencies can use to brainstorm ways to be faster and more collaborative in their organizational structures and creative processes. Explore the best practices. Last week we hosted a G+ Hangout on Air “Coders and Creatives: 2 Angles on Agility” featuring Google engineers and ad executives. The discussion centered around new models of collaboration, how creativity can thrive in a condensed timeline, and the power of prototyping both products and ideas. If you missed it, watch the highlights video. If you’d like to see the full 50-minute hangout, head here. Also, check out Ad Age’s article on Agile Creativity for more information. , Spark is a series of custom, co-programmed events created to deliver unique education and innovation experiences in an intimate setting for GroupM clients and media agencies. restaurants, and media professionals from Maxus, MEC, MediaCom and Mindshare in attendance. After a welcome from GroupM Next CEO Chris Copeland, Google’s Torrence Boone, Managing Director, Agency Business Development, and Brett Goffin, Emerging Business Lead, Mobile, as well as Pat Monteleone and Jesse Wolfersberger from GroupM Next, Bryan Gildenberg of Kantar, Steven Rosenblatt of Foursquare and Tim Zagat, co-founder and CEO of Zagat, took the stage to share insights into the intersection of retail and digital, and ways that brands in these industries can benefit from what’s taking place. In-store shopping. E-commerce. A digital footprint. Mobile. Local visibility. Price comparison…and more. These are all things retail and restaurant marketers should be factoring in their marketing strategies to maximize traffic, engagement and revenue. With these in the forefront, retail and QSR companies will prosper in today’s digitally-driven world. For the future, as brands engage more strategically and proactively via channels and emerging platforms that enable hyper-targeting across digital media, social interaction and location-based targeting, they’ll attract and retain loyal customers, while emerging ahead of the competition. focusing on trends, research and digital opportunities in Retail and QSR. Launched in June, Spark is a series of custom, co-programmed events created to deliver unique education and innovation experiences in an intimate setting for GroupM clients and media agencies. , which will arm you with the tools you need to get the most out of Google’s advertising products and solutions. Over the next couple of months, 12 webinars will teach you tips and how-to’s to help make the web work for your business. for a special Google+ Hangout On Air featuring advertising industry executives in conversation with Google engineers. Over the past year we’ve had many discussions with ad agency executives about how they are reinventing their business models to excel at the pace of digital. Many of our agency partners are applying practices inspired by the tech world in order to work faster and more collaboratively. We hope you’ll be there and be inspired to maximize the agility of your agency with some of the concepts discussed. RSVP for the event to have it appear in your calendar. If you have a question for the panel, leave your questions as a comment on our hangout announcement post. On August 8th at 1pm EST, to view the Hangout on Air, visit the Think with Google Google+ page, look for the “Hangout on Air” post within the stream, and click “Play” to tune in. Don’t forget to be signed into Google+! Join us tomorrow, August 8th, at 10am PDT/1pm EDT for a special Google+ Hangout On Air featuring advertising industry executives in conversation with Google engineers.